The Edsel was made by Ford. 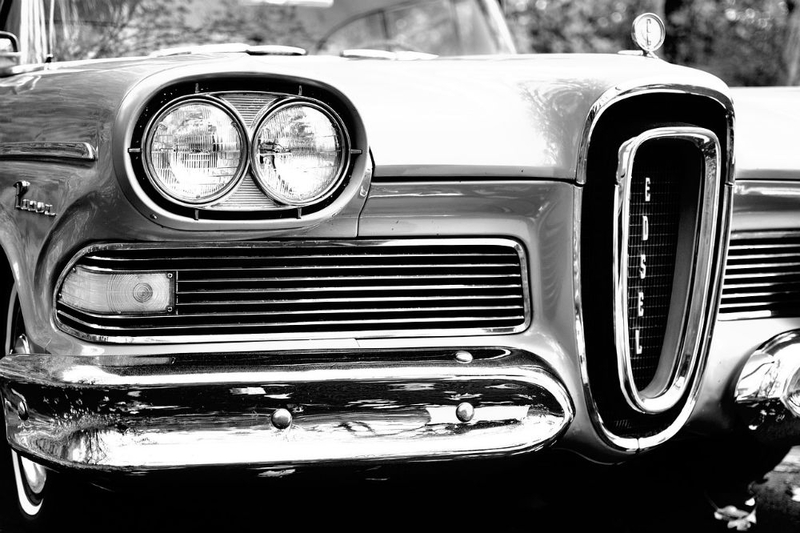 The great American manufacturer, though, sold the Edsel as a marque in its own right. Ford confidently predicted that it would sell 200,000 Edsels - in the first year alone! As it turned out, a mere 62,000 units were shifted. Since the Edsel had cost Ford $250,000,000 to develop, that was not good! The Edsel ended up a white elephant. Which was a shame, because it was not a bad car. It was just that the timing was out. Ford's sales team had targeted lower-middle demographics - somewhere between their luxury models and the cut-price Mercury. When the Edsel went into production, the automotive trade was depressed - with customers looking to buy cheap. The Edsel was stuck in marketing no man's land! There were echoes of the Ferrari Dino in the Edsel. Both cars were presented as unique marques. Both, too, were named after sons who had died prematurely. Dino Ferrari and Edsel Ford both passed away early - and the cars were fathers' tributes. It was especially sad, then, in the case of the Edsel, that sales were so poor. A feature of the car that certainly did not help was its vertical grille. American buyers simply did not take to it. Ironically, the rest of the Edsel was conservatively styled - at least as compared with its Fifties rivals! The Edsel 'brand' comprised 15 models - including saloons, convertibles and station-wagons. The one thing they had in common was the floor-pan. The Edsel's engine came in one of two flavours - straight-six or V8. Peak power was 350bhp. Top speed 108mph. The manual and auto gearboxes were both 3-speed. Biggest capacity was 6,719cc. Those Edsels that are left are highly sought-after. Indeed, in different circumstances, the Edsel may well have been a success story. As it is, it has to settle for an impressively high 'quirkiness' quotient!